Glenn Beck -THE SCUM OF THE EARTH! Usage notes: Scum is a layer of unpleasant or dirty substance that has formed on top of a liquid. 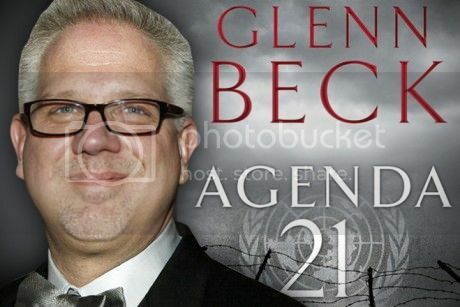 Glenn Beck Has the Paranoid Conspiracy World Cowering with Agenda 21? When the Corporate Elite tells us we need to be afraid of something, they almost always expect to make some money off our fear. From the same people who brought us the Ground Zero Victory Mosque, FEMA concentration camps, and every single George Soros conspiracy theory, comes a brand new hyper-paranoid threat-to-Americas-sovereignty that, they say, should scare the hell out of all of us. 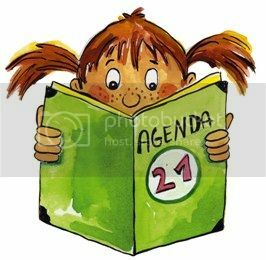 It goes by the name of Agenda 21, which just so happens to be the title of Glenn Becks new dystopic novel. Billed as, more frightening than anything Orwell could have envisioned, Becks Agenda 21 paints a disturbing picture of America following the implementation of the United Nations Agenda 21, which is actually a real life UN initiative, though not nearly as nefarious as Beck would have us all believe. Over at GlennBeck.com you can watch a movie trailer made specifically for the book featuring grizzled Americans lined up on the streets in a post-Soviet winter landscape reeking of desperation, waiting for tiny morsels of food to be parceled out by the authorities. Reminiscent of both Nazi concentration camps and the Book of Revelation, everyones foreheads are tattooed with identification numbers  and in homage to Sarah Palins death panels, one scene in the trailer depicts an emaciated, scraggly-haired old man loaded on to a conveyor belt and sent into a burning furnace. Of course, this is all fiction. Whether you like him or not, Beck has made a fortune off sensationalism  and more recently televangelism  and this book will tap into a wellspring of paranoia on the fringe Right that will undoubtedly make a lot more money for multimillionaire Mr. Beck himself. But whether Beck really believes in his depicted Agenda 21 future for America isnt all that important. Whats important is that a lot of other powerful people do believe in it. To them, theres nothing fictional at all when it comes to Agenda 21. Agenda 21. It was emceed by a man named Field Searcy who, according to MotherJones, is a local Conservative activist, whose Tea Party leadership was revoked after endorsing birther and truther conspiracy theories. But on that day, Searcy had the attention of his states most powerful lawmakers  including the Republican Partys Senate Majority Leader, Chip Rogers  to warn them of President Obamas wicked plot to use Agenda 21 to hand the United States off to the United Nations. Searcy told the Georgia Republicans, and later spoke of it on the Thom Hartmann Radio Program, that President Obama is using a mind control procedure known as the Delphi Technique to slowly condition Americans to submit to the control of the United Nations Agenda 21, which will, according to Searcy, force mass migrations of Americans out of the countryside and into the cities, while handing over control of our rural lands to an international, one-world government. The goal of the presentation was to influence Georgia lawmakers to follow in the footsteps of Tennessee and Kentucky Republican lawmakers whove already passed legislation to block Agenda 21 from being implemented in their states. In fact, earlier this year Republican Senate Majority Leader Chip Rogers introduced legislation in Georgia to do just that.